The solution for web-analytics, the source of detailed information on the performance of SharePoint-based portals and websites. Product reports are covering such aspects as users and their behavior; usage of content, documents, list items and search services. The product is a source of essential information on portal usage for IT management, project managers, web editors, business managers and others. Work for HarePoint Analytics for Microsoft SharePoint? 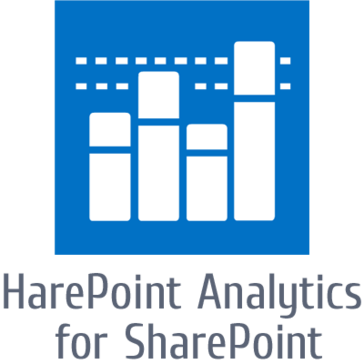 Learning about HarePoint Analytics for Microsoft SharePoint? "Easy to use, quite flexible for users and admins"
The reports are displayed inside the site collection and are available for owners. Easy to use. Support is very friendly, competent and flexible. Just ask for help and you will get it. "Single Stop for all your sharepoint analytics reports"
It is quick and very effective. We have been using this product for a while in our company and for our clients. Our client has lots of SharePoint sites and its a pain for the administrator to manage but this product helped us a lot. More insight and control over the user visiting the pages as we have internet sharepoint sites. So more seamless integration with google will be helpful ! It has resolved lot of issues for the SharePoint administrator. This product is easy to use and helped us create management reports and analyse usage trends we needed. We were looking for a solution to justify spendings on sharepoint ressources (Space and processors/RAM) and for creating monthly reports for management. This product is perfect for these tasks. "Good tool but complicated deployment / setup "
* We monitor all HarePoint Analytics for Microsoft SharePoint reviews to prevent fraudulent reviews and keep review quality high. We do not post reviews by company employees or direct competitors. Validated reviews require the user to submit a screenshot of the product containing their user ID, in order to verify a user is an actual user of the product. Hi there! Are you looking to implement a solution like HarePoint Analytics for Microsoft SharePoint?